Andy Murray's Wimbledon triumph was lauded in Monday's British newspapers after he beat Novak Djokovic to deliver a long-awaited home success in the men's singles with The Times calling the Scot 'The History Boy'. 'At last' read the front page of the Daily Telegraph sports section next to a picture of the smiling champion, adding: "Murray at the pinnacle of his game as he becomes the first British man to win Wimbledon since Fred Perry 77 years ago". 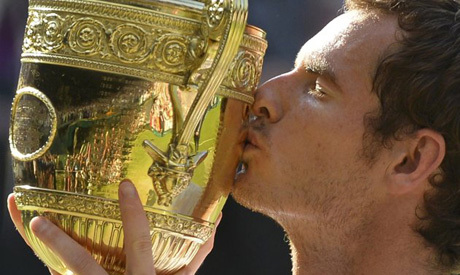 The Daily Mail front page headline was 'Now it'll be arise, Sir Andy' as it raised the prospect of the 26-year-old being knighted alongside a picture of him kissing the gold trophy after beating Serbia's world number one 6-4 7-5 6-4. "It was an astonishing end to an astonishing day. Andy Murray secured his lifetime's ambition by winning a final game of nerve shredding drama yesterday that summed up an unforgettable Wimbledon final, full of stunning tennis and with more plot twists than an Alfred Hitchcock thriller." Most papers ran special supplements on Murray's success and some included victory posters after the Scot ended what The Times called: "The longest yearning in British sport..."